April 26th - 7:00 pm - 9:30 pm - A Special Women's Circle, Sacred Repair with Barbara Mainguy. We've been learning more and more about the indigenous forms of hands-on healing that exist in North America. We have traced the origins of American Osteopathy to Andrew Taylor Still's interactions with Native people in Missouri and Kansas before the American Civil War, including the Pawnee, Shawnee, and Cherokee. These tribes influenced each other with their healing practices and Still was fluent in the Shawnee language, their form of hands-on-healing being very similar to that of the Cherokee. We will see how Native American forms of bodywork and hands-on-healing have been passed through Still into contemporary American osteopathy and discover its indigenous origins. Traditional Cherokee people called their techniques of hands-on healing “reading the body,” and in this workshop, we will demonstrate these indigenous techniques, comparing them to American osteopathy and traditional Chinese medicine. We will explore how these indigenous people used various strategies for touching the body, including deep pressure, rocking, shaking, running energy meridians, mobilization, and breath work as a means to restore spirit to all parts of the body, We'll guide you through supervised practice with the methods of Cherokee bodywork and offer examples of incorporating imagery and dialogue; the importance of ceremony, ritual, and intent; manipulative medicine as a means of dialogue with the body; Cherokee acupuncture and knowledge of energy meridians and energy medicine; understanding how this form of healing as mind-body-spirit integration takes place in community; and more. As we complete our time together with a prayer ritual, we ask for a blessing on the healing work we have done and the continuing journey that lies before us. After April 15th, weekend $300 or one day $150. Our goal in teaching these methods is to bring greater awareness to the contributions of these indigenous people to the profession that is American Osteopathy and to return to Still's origins when he taught his students to "look at the body with Indian eyes." 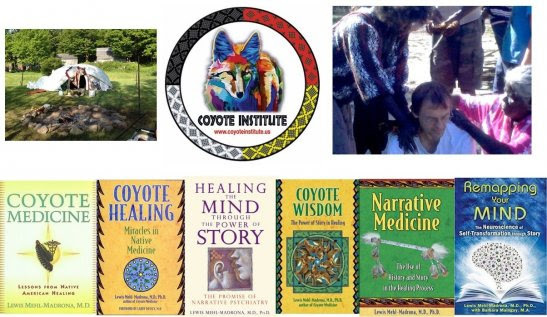 Through Coyote Institute we aim to recover vanishing forms of manual medicine from North America and invite dialogue with other practitioners and scholars about these forms of healing. Lewis and Barbara's honorarium for this workshop goes to Coyote Institute to support its mission in facilitating cross-cultural dialogue among indigenous people and contemporary health care practitioners. Sacred Repair; Women as ‘wounded healers’ bring their wild energy, informed by struggles and suffering as we walk in this world. The healing stories we tell are a unique offering from this feminine medicine. Join this group of women and circle up for an evening of exploring and honoring your medicine walk. Please bring a rattle or drum, bottled water, and a journal. Barbara, MA, is involved in creative arts psychotherapy and group medical care, especially in relation to geriatrics and people with psychosis. She is a filmmaker and a visual artist and is currently editing a film on how society decides whom to call "mad". Her M.A. is in Creative Arts Therapies from Concordia University (Montreal) with an emphasis on Drama Therapy. She is the author of scholarly papers on embodied narratives and drama therapy with autism and schizophrenia. Together, she and Lewis have written Remapping the Mind, published in 2015.